If your company generate big amount of sales from multiple customers, it can be very difficult task to follow up all the PR documents (Payment receivable) issued by your customers. Customers are usually make their purchase immediately and make full or partial payment in order to get their goods. 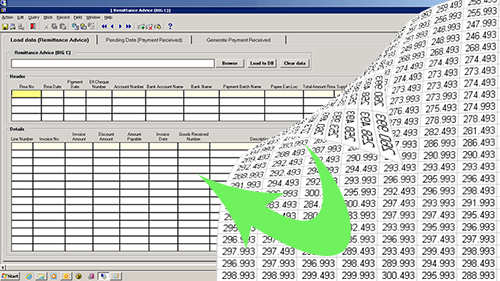 In case that the payment was done by a voucher that your computer system generate , then it will be easier to manage the process , but it can be a big challenge to follow up hundreds of payments , issued by ATM money transfer , or any other bank payment process in order to match customer payment method to specific customer name. Compass Softwares realize the needs of a specific system to help your business accounting operations by closing the gap between your customer payments and the accounting department. That’s why we introduce the ability to connect to your local database (It can be Oracle, Microsoft SQL or another database) and make these relations easy to use by implementing our Bank Statement module. Similar to the Bank Statement Module, the Bill Payment Module assist your accounting team to clear customer’s payments fast and accurate, by managing payments vouchers that were issuing by your system. It’s not just a follow up module, but it is also a module that can improve the productivity of your team while giving the customer the confidence of getting products on time. Another example of Enterprise Application Integration, is the module that can automate scan documents into your current computer system. 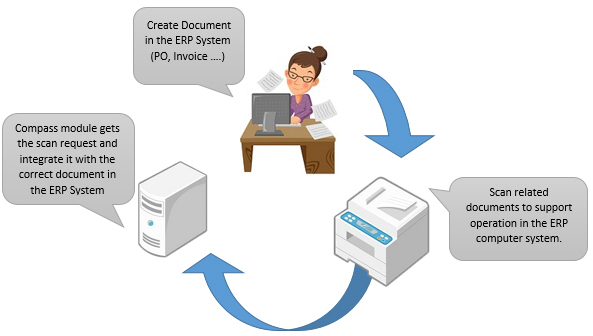 The module makes the relationship between these documents to a specific item in the computer system (it can be a Purchase Order, Invoice or another) and provide the user easy access to it. In many cases there is a need to backup a PO, for example, with external scan documents and here where our module can help in order to get these documents fast and in the correct order. Trading in the food industry can be a complex operation, as a trader you will have to provide your customer with variety of products which will generate your future orders, as a results of that, the accounting department will have to deal with hundreds or thousands of transactions and manually input it into your local computer system. Most of suppliers or corporates will be able to provide you with the related data on soft file, such as Text file, Excel file or even on XML file. At Compass Softwares we develop an automation modules that can read most of files of data and transfer it into your local system. By using our modules your accounting team will improve their productivity, will avoid mistakes of data type, and will give you the correct status of bill payments related to your customers.